Article today from Alt Media – no more capacity on the Inner West Light Rail. The government marketing says “The Dulwich Hill Light Rail is a victim of its own success.” But what they should really say is that it doesn’t have enough capacity to carry the numbers of passengers that need to use it. The CBD and South East Light Rail will be like this on day one, as the report commissioned by Randwick Council revealed. Last Sunday, at around 14.30, a crowded Inner West light rail tram heading to Central broke down at Convention, stranding its passengers in the sweltering heat. “We were travelling along, it was really crowded, and then it suddenly stopped,” John Webber, passenger, said. “The delays were caused by a light rail vehicle being withdrawn from service at Convention stop due to a technical failure,” a spokesperson for Transport for NSW said. A victim of its own success, the Central to Dulwich Hill light rail frequently experiences crush conditions and breakdowns. The existing fleet of 12 trams has reached capacity along the 12.8 kilometre route from Central Station to Dulwich Hill as patronage has surged by more than 260 per cent to 9.4 million trips in 2016-17. 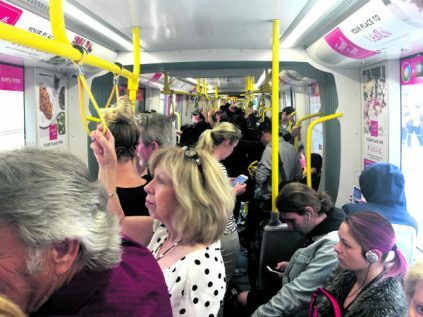 “The Government has totally underestimated demand for the light rail and has no plans to increase capacity for the service,” Jo Haylen, Labor MP for Summer Hill said. A modelling of the system predicts an upsurge of 47 per cent in patronage to 4,400 in peak hour by 2021, increasing to 5,200 by 2031. “No business case for future upgrades to the Inner West light rail infrastructure has been finalised,” a spokesperson for Transport for New South Wales said. The line opened in 1997, running to Wentworth Park, and was extended to Lilyfield in 2000, following the route of the old goods line. Another 5.6 km extension to Dulwich Hill with nine stations opened in 2014. The line is currently served by a fleet of 12 Spanish-built Urbos 3 trams with a capacity of 206 and a crush capacity of 272 passengers. These replaced the original fleet of seven German-designed Variotrams which were decommissioned in 2015. “What they could have done is to keep the original trams, but they pensioned those off straight away,” Colin Shroeder, co-convener, Eco Transit, a non-aligned transport lobby group, said. The crush comes during peak hours, when the trams run every eight minutes with a capacity of 80 seated and 4-6 passengers per square metre standing. The afternoon peak hour has been extended by one hour to 7pm. Transport for NSW’s own data shows that the biggest crush on the route is between Glebe and the Fish Markets, which are due for an upgrade and a doubling of patron capacity over the next few years. “The Dulwich Hill line is already one of the most heavily used light rail lines in Australia,” Greg Sutherland, light rail expert said. Since the line opened, 2,300 new dwellings have been built at Harold Park, Summer Hill and Dulwich Hill, and another 2,400 are due to come on line at Darling Square near Haymarket. “Even without the units it would still be very popular, and with the units it is really straining to cope with demand,” said Mat Hounsell, senior research consultant, Institute for Sustainable Futures, UTS. Taking into account the two plus years waiting time to purchase new trams, even an additional four trams will not provide a long-term fix. Other problems are created by how the light rail actually runs. “These are the number of unnecessary and avoidable stops that are caused when the trams have to cross streets that are controlled by the Roads and Maritime Services, and they haven’t changed the sequencing of the lights,” Greg Sutherland said. The single track at the Dulwich Hill terminus also creates delays with turnarounds. “There is a possibility to add a second track to the terminus at Dulwich Hill and then trams would run faster,” Mat Hounsell said. Increasing the frequency of service to every four minutes could be another short-term fix, but the system overall fails due to the gutting of its intellectual and operational knowledge. “It’s the de-skilling of the public service in NSW that has resulted in sub-optimal operations across the state and a mistaken belief that Melbourne was a totally different technology system that meant that we haven’t sought advice from Victoria,” Mat Hounsell said. “The TfNSW wouldn’t admit that Melbourne had more expertise than they did,” Greg Sutherland said. The problems are likely to be compounded with the addition of the SouthEast light rail to the system. Due to the Government choosing two separate proprietorial systems, there is no compatibility across the networks. “I suspect that if the government is going with a single source (operator) then that single source would be able to claim whatever it wanted and that is why we are strongly against monopoly contracts,” Mat Hounsell said.